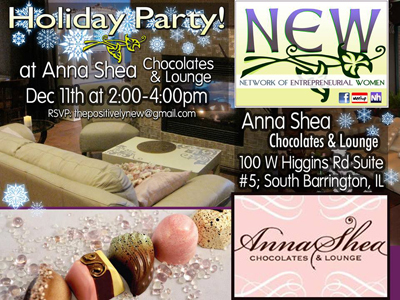 Our combined NEW Meet & Munch and Wine, Women and Wellness event will be held at Anna Shea’s Chocolate Lounge in the small lounge. At The Arboretum of South Barrington, 100 W Higgins Rd Suite #5, South Barrington, IL. Founded in 2004, Anna Shea Chocolates provides handcrafted artisan chocolate from fresh and fine ingredients, offering a sweet destination for our year-end celebration. We will have Nifty Educational Wisewoman Trivia during which we’ll break up into teams, make up awesome team names, and then test our knowledge of women and winter themed trivia. A member asked if we could do a Holiday Recipe Exchange. Bring your favorite holiday snack recipe (sweet or savory) along with samples for us to try. The lounge offers chocolate fondue and wine and chocolate pairings on their menu which each attendee can order on their own. This will be our only event for the month to give everyone time to close out the year and enjoy quality time with their families.